It's back. You know, I plan my menu every week, but for some reason, I keep forgetting to share it. I absolutely adore the process of choosing recipes each week (almost as much as I like going to the store and crossing things off my list). Lately, I've been really into couponing, so this week's menu was highly influenced by a bag of potatoes, lots of leftover rosemary, and a tub of blue cheese. 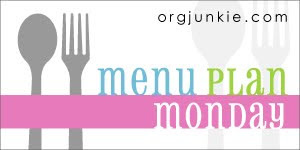 Check out I'm an Organizing Junkie for more Menu Plans. Sunday: Super Bowl!! I'm taking Buffalo Chicken Dip to the party I'm attending. This recipe is from a guest on Rachael's talk show. Monday: This will be our Valentine's Day meal, since we will be traveling next Monday. We usually do some sort of steak or seafood, so this year it's Beef Tenderloin Steaks with Gorgonzola, Roasted Baby Potatoes with Rosemary, and Green Beans with Portobello Mushroom Saute from 30 Minute Meals. Wednesday: Spinach, Artichoke, and Chicken Penne from Rachael Ray's talk show. Thursday: Leftovers for the husband and me out of town!